Our goal is for you to be absolutely thrilled when you receive your Solid Terrain Model. If you are not completely satisfied with your new STM model we promise to find a way to make it right. Solid Terrain Modeling (STM) is a leading provider of genuine 3D Map Models of geographic locations capable of depicting real-life locations and spaces anywhere in the world. Map models today are important to depict size, terrain, points of range, sight lines etc., for whatever use, like national and state park map models, museum map models, exhibition and artistic display map models and even military map models. These 3D renderings can be made into any size or shape - whether you need plateau top or protect mounted, tiled or even an entire exhibition - STM can create a realistic and accurate 3D map model to help you better understand and sense of a location. Solid Terrain Models are Communication Tools: Combining the worlds of flat maps, satellite imagery and 3-dimensional physical terrain models. STM models extraordinarily rich color imaging applied to the dimensional surface make them as beautiful as they are informative. STM's patented technology makes these models fast, accurate and affordable. 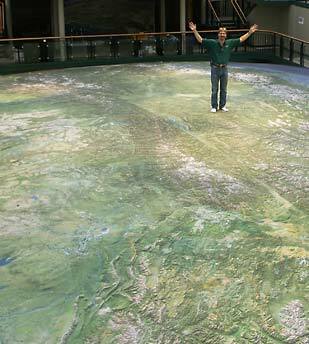 This fantastic model( terrain map ) made of 100 panels showing the curvature of the earth, spans 74 feet long by 40 feet wide covering over 1 million sq miles of British Columbia, from Washington State to the Yukon Territory. Click here to find out more about this incredible project.